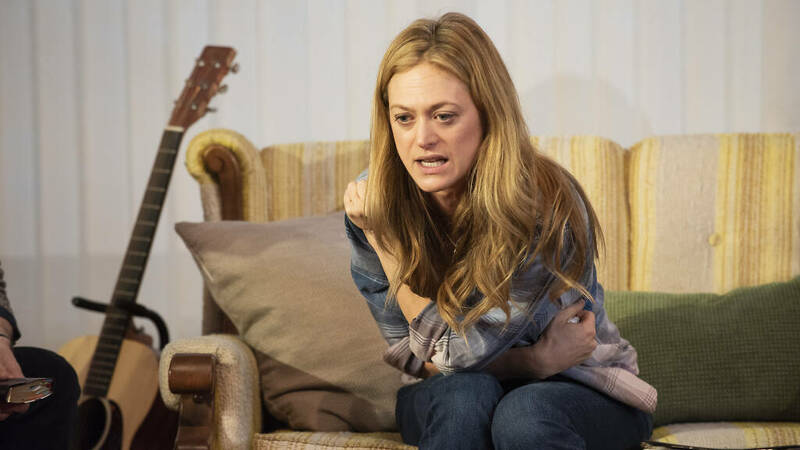 In Abby Rosebrock’s new play, feisty English teacher Alison (Marin Ireland), a gal with serious anger management issues (she took an axe to her principal’s Honda), moves in with the longstanding residents of St. John’s Service House, a church-sponsored halfway house in Western North Carolina. By turns friendly and collegial, confrontational and prickly, Alison ultimately disrupts the delicate harmony of the group which includes their pastor Hern (Chris Stack), his assistant Grace (Nicole Lewis), her new roommate Cherie (Kristolyn Lloyd) who’s a French teacher, guitar-strumming Lothario Wade (outstanding Kyle Beltran), and sweet-natured veteran Cole (Peter Mark Kendall), all recovering from various addictions (pills, alcohol) or psychological issues. 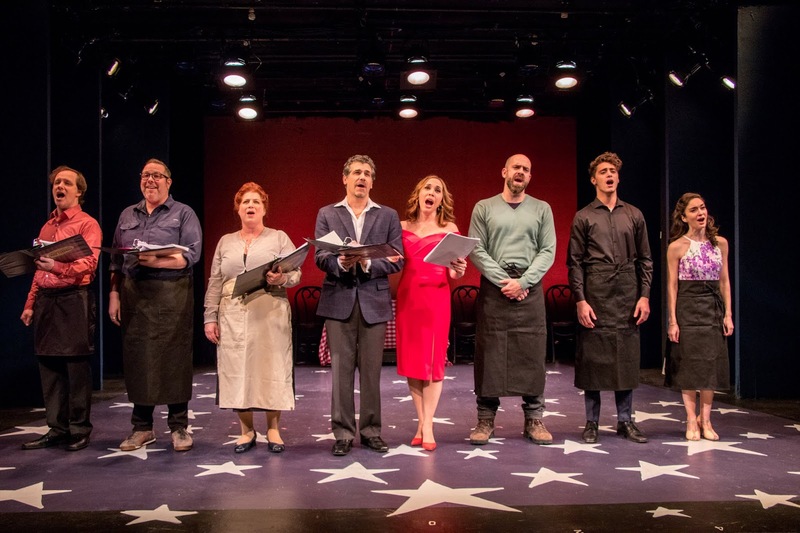 “Blue Ridge” bristles with energy, humor and sharp characterizations, and touches on themes of race, class, and #MeToo issues, the last having to do with the mid-play revelation of an inappropriate romantic liaison. You care about all of her characters, and despite flaws, most especially Alison’s abrasiveness, grow to care for all of them. This is as much due to the appealing performances of the ace cast, and a galvanic turn by the great Ireland. Taibi Magar directs her ensemble with fine sensitivity, though the naturalistic overlapping of fast-talking dialogue, and Appalachian accents, occasionally hinders audibility. Adam Rigg’s settings, lighted by Amith Chandrashaker, including the group’s Bible study meeting room, have the right institutional ambiance. And the other production elements, such as Sarah Laux’s costumes, Mikaal Sulaiman’s sound and music, are fine, too. 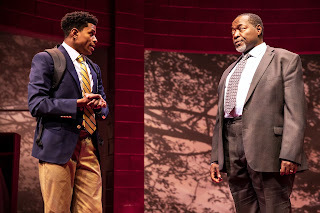 I didn’t catch “Choir Boy” when it played at Manhattan Theatre Club’s Studio at Stage II back in 2013, but in the wake of playwright Tarell Alvin McCraney’s Oscar win for “Moonlight,” the play now comes to Broadway with original lead Jeremy Pope, along with some others of the original production, again headlining. It’s an absorbing tale of Pharus, an effeminate boy in an elite black prep school whose students adhere to a steadfast code of honor and belief in God. At the play’s start, he has been chosen to head the gospel choir. In the very first scene -- the previous semester commencement ceremony -- we see him discreetly heckled by the school bully Bobby (J. Quinton Johnson) who happens to be the nephew of the headmaster Marrow (Chuck Cooper in one of his best roles). Pharus falters momentarily in his rendition of “Trust and Obey” but then forges on. Once Pharus lands the plum position of choir head, however, he dismisses Bobby for the latter’s consistently disruptive behavior. Eventually, Marrow hires a colleague -- coyly named Mr. Pendleton as he's played by a rather underpowered Austin Pendleton -- to teach the boys creative thinking. As the play progresses, we learn that though Pharus is outrageously flamboyant in his manner, he is, in fact, still a virgin, and feels all the more unfairly hassled for simply being as he is. (He says he’s “sick of people calling me something I ain’t doing.”) But it’s not just his presumed sexuality that riles his colleagues and teachers, he’s arrogantly boastful about his talent to boot. Other students -- all persuasively played if rather stereotypically written -- include troubled David (Caleb Eberghardt), trying hard not to take sides in the conflict between Pharus and Bobby, as he’s clearly being pressured by his family to graduate with honors and become a pastor; Pharus’ muscular roommate Tony (John Clay III), straight but empathetically non-judgmental; and Bobby’s devoted acolyte Junior (Nicholas L. Ashe) who tries to temper his friend’s bad behavior. 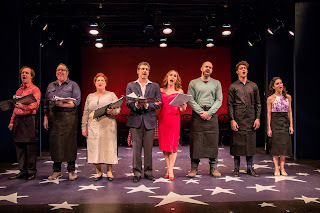 The boys (including four ensemble players) sing beautifully when the plot calls for it (in Jason Michael Webb’s stirring arrangements), and McCraney and Pope mostly succeeds in making the more than a little abrasive protagonist ultimately win our sympathy. Basically, Pharus knows he rubs people the wrong way, but after enduring years of repression at home, he feels entitled to act out at school. Pope conveys all this most convincingly, and Cooper is realistically sympathetic to all that transpires, at least to the extent his position will allow. The Pendleton component feels shoehorned in, and doesn’t quite convince. HIs presence does allow for a lighter moment when his characters asks the boys to pick a song that meant a lot to them as a child. McCraney has an expert ear, and his dialogue is often compelling, including a discourse on the nature of spirituals. Trip Cullman directs with his customary sensitivity, and provides the cohesion that the play occasionally lacks. David Zinn’s simple scenic design -- school rooms, dorm, and shower room -- and prep school costumes are spot on. Peter Kaczorowski’s lighting delineates the school and dorm scenes and the onstage presentational moments. The text could benefit from some trimming, but shortcomings aside, this coming of age tale is worth catching.